To add local flavor to his ceramics, Hsieh Tung-cheh has endeavored to replace the creatures that traditionally feature in cochin ware with rare Taiwanese creatures with similar symbolism, like Mikado pheasants, Swinhoe's pheasants, Formosan clouded leopards, and leopard cats. 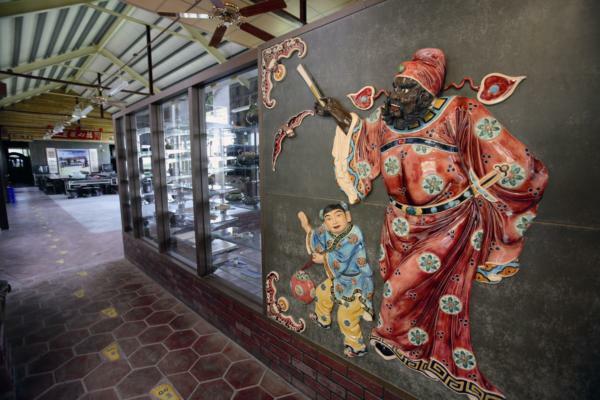 He has also added new, creative ideas for different temples, like incorporating elements of Taiwanese history into the decorative pieces for Tainan's Nankunshen Daitian Temple (鯤鯓代天府). People's lives seem to proceed according to their own particular plans. While the children of impoverished families may never experience material prosperity, sometimes they find happy ways out of hardship and into comfortable lives. 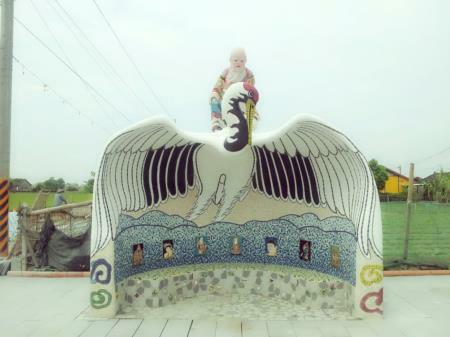 Hsieh Tung-cheh grew up as the son of parents who sold oyster omelets by the Beigang Chaotian Temple (北港朝天宮). At age five, he became fascinated by temple art, immersing himself in temple culture and paving the way for his future creative works. That year, Chaotian Temple was under renovations, so there were a number of masterful artisans at work there. 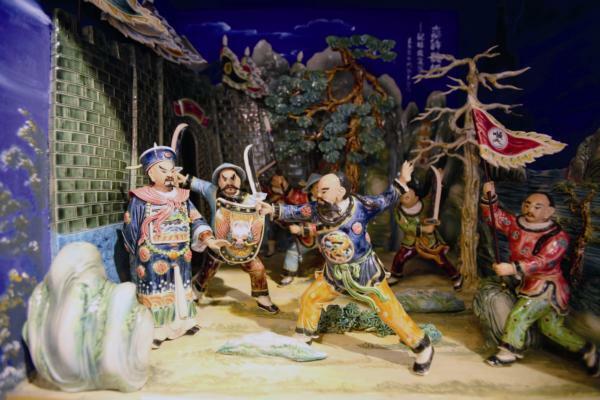 When the cochin ware craftsmen were on the job, Hsieh would draw closer for a look. Seeing their elaborate works, his young spirit was filled with admiration, and he grew ever more interested in cut-and-paste ceramics and cochin ware. After he graduated from junior high school, with his family unable to pay for his senior high tuition, Hsieh chose instead to study the art that had come to so fascinate him. Doing so in those days required having certain connections, though, making it difficult for outsiders to learn the craft. Fortunately, one of his sisters had just gotten engaged to a cut-and-paste cochin ware ceramicist, Chen Zhong-zheng (陳忠正). 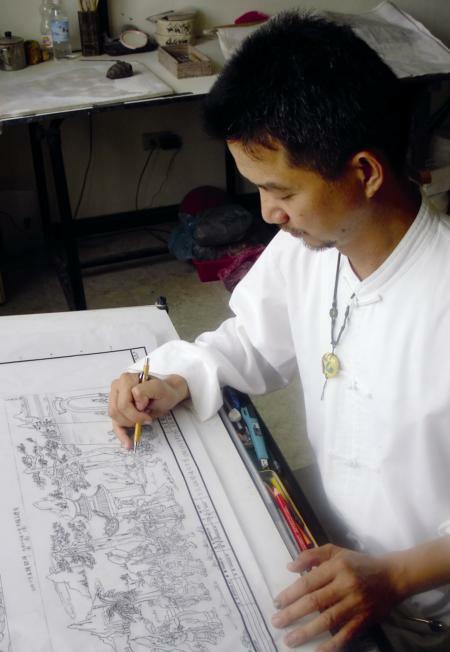 Even though these arts are usually passed down from father to son, the process still adheres to a strict 40-month apprenticeship period, so even though the two were brothers-in-law, Hsieh found himself responsible for the usual apprentice tasks outside of his education, like cooking and doing chores. In fact, the relationship actually meant his mentor was even more demanding than usual. Studying the craft side by day and painting by night, Hsieh plugged away tirelessly until he was able to finally complete his apprenticeship at age 19. 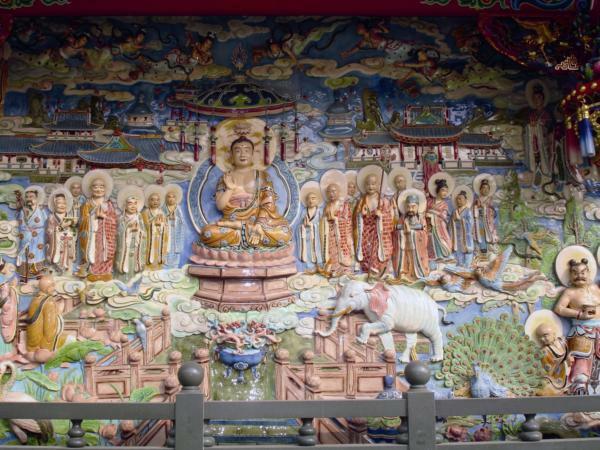 After a brief detour to complete his national military service, Hsieh set out to start his own business in cut-and-paste ceramics for temples. He worked for temples all across Taiwan like an itinerant laborer, but along the way, he picked up valuable practical experience and a deeper understanding of the temples, gods, and related culture and history of places around the island. Outside of his work, Hsieh also began to take classes from professor Lin Heng-dao (林衡道) on Taiwanese historical sites, and worked as a docent and repairman for historic temples. When he saw how the cochin ware industry was moving to China, rather than going with the flow, Hsieh chose to stand firm in Taiwan and create his own brand, Old Ben Kang Ceramic Arts (古笨港陶華園), to cultivate the art here. In addition to his own creations and public art pieces, Hsieh has also begun branching out into cochin ware home decorations, combining traditional glazes with modern themes to create porcelain for homes that present a different side of Taiwan’s cultural creativity. Visitors Today:47. All Time Visitors:1,229,854.